It has come to my attention that some people don’t like what I do here, or perhaps don’t like the way that I do it. That isn’t really surprising, though the expression of that displeasure has included some surprises. There will always be differences of opinion, or differences in priority, or just different points of view and, though I try to be respectful in all cases, it is just not possible to please everyone. Nor is it healthy to try. When I had the time to do daily, full-length written entries here, it was more likely that I could explain all of the things that I was doing, the whys and wherefores, where I was coming from and where I was going, and what it all meant. Scheduling being what it is these days, that just isn’t practical. I honestly don’t believe that it should be necessary, either. I did more than a year laying down some pretty solid groundwork, and I’ve never been opposed to answering questions. I will not engage in conflict here - that is not what Frequently Interrupted is for or about - and I make every practical effort to limit or remove conflict from the rest of my life, but I am always happy to engage in conversation, and will even gladly try to explain myself, my beliefs, and my actions, within reasonable limits. It is, afterall, my life. While it can be helpful if other people understand, it isn’t actually required. I will pop in occasionally and give reminders, and this seems like a good time for that. First and foremost, I cannot stress enough the reminder that what I do here is for me. I have depression and anxiety. I have struggled with suicidal ideations for most of my life. I have been a victim of bullying, and I have tried to understand a world that doesn’t always … look right to my mind. I don’t say any of this in a “look at me” way, but to encapsulate the motivations behind this project. When I began the process that would culminate in Frequently Interrupted, just under three years ago, I was going through a very hard time. Though I have done quite well for many years in managing my issues, it was safe to say that I was suffering a pretty significant relapse. There were a number of stressors that aren’t important to this specific account, and there was always the underlying factor that sometimes a mental illness just says, “Gotcha!” For a combination of reasons, I was spiraling downward, and it was getting scary. I decided to go back to the beginning, to walk again some of the paths that had helped in the past. I would reconfirm my commitment to myself, to my health, and to my ongoing forward progress, and, this time, I would invite others to participate. Safety in numbers, and learning from each other. I have often been asked about practices and lessons I have used, and I have usually had a difficult time explaining because that was then, and I’m not very good at explaining then. This time, though, I could explain it now, as it was happening, and I would have things written down, which would help with the explaining then if it comes up again in the future. Extra credit for multiple solutions! I present what I do in the hope that it helps others, but you have to remember that the goal is to help myself. I’m not preaching; I’m reminding myself. I truly believe that, if more people were to practice some of the things I talk about, the net result would be positive for all, and I am all for that, but I can only control me, so I only try to control me. I tell you what I am experiencing, what I do about it, and what the results are. It’s up to you to extrapolate from that what it all means for your life. I can’t do that for you, but please understand, I also can’t not do what I need to do because you might not be able to extrapolate properly from it. That is not a reasonable request. I invite you to participate in my journey, but it is my journey. Walk with me or don’t, as you see fit, but I must keep walking. My priorities here are mine, as they must be. I do not ask anyone to set aside their own priorities. I only show mine and invite you to join in if you are so inclined. As long as you are not causing harm, I have no opinion on your priorities. They are not mine, and are none of my business. I am actually glad that we do not all share the same priorities. It is a large world with many important issues. I cannot possibly give proper attention to everything that needs attention, so it is good that other people do so. We work in cooperation, not competition, and we can accomplish so much more if we understand that. Do not be upset by someone else’s priorities. 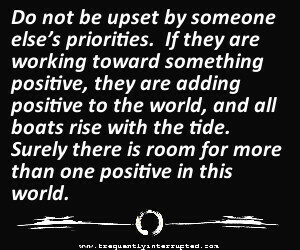 If they are working toward something positive, they are adding positive to the world, and all boats rise with the tide. Surely there is room for more than one positive in this world. My priorities here at Frequently Interrupted sprang out of my own issues and my own needs. I am a suicide survivor who was staring down that black tunnel when I conceived this project, so that priority was baked into the very foundation. My depression, my anxiety, my grief, my experience with bullies, all of these tie directly into my struggles with suicide, so they are naturally a large part of what I would choose to address. Zen, music, nature and natural philosophy, culture and heritage, all of these have been beneficial tools in living my life, so it is only natural that I would want to spend time talking about them. When any of those pieces combine, the synergy should be fairly obvious. Maybe it’s not always so obvious, but I think it usually is. When it isn’t, feel free to ask. I’ll usually answer. It may be too personal to answer, and I may say that instead, but, as long as you understand that, we can still have a beneficial conversation. I’m doing what I can, but I can only do what I can. “I'm not a prophet or a stone-age man / Just a mortal with the potential of a superman.” (David Bowie - “Quicksand”) It is not my goal to push anyone away, but I can’t control the response, only my own actions, and I have to take the actions that are best for my own health. There are many bumps in the road. I will trip, I will stumble, but I will keep going. I will offer you a hand and invite you to walk with me. If that helps you, take my hand and join me. If that does not help you then I will wish you a good journey and hope that you find the path that is best for you. There are many ways to the summit, and we do not have to walk together to have the same goal. We can help each other, we can stay out of each other’s way, or we can trip each other. Only one of those options is truly negative. If you join me, welcome. If you don’t, good journey. All I ask is no tripping, and keep moving forward.